Feed your muscles and your mind with NEW! 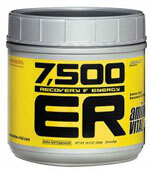 Amino Vital 7500 ER Fuji Apple or Arctic Lemon. The unique combination of BCAAs, glutamine and arginine reduces the catabolic effects of strenuous exercise and replenishes amino acid stores to help you rebuild muscle tissue immediately even as you train. Essential Amino Acids Including BCAAs! Supports Nitric Oxide Synthesis With Natural Energizers! Everybody wants a lean, muscular physique. Like anything worth having, wanting it isn't enough. You have to commit to a rigorous diet and training program that will tax your strength mentally as well as physically. To help you satisfy both of these demands, ON's Essential Amino Energy combines the optimal ratio of rapidly absorbed free-form amino acids with natural energizers and N.O. boosting ingredients to help you reach your next level - including muscle-building BCAAs and arginine for more intense, vascular pumps. * At 10 calories per serving, it'll make a big impression without denting your diet.Essential Amino Energy anytime you want to dial up mental focus, physical energy N.O. production and muscle recovery. NEW Mandarin Orange, Fruit Punch and Lemon Lime. Mix & Shake Endurance is the "All in One" Amino Vital product: 2400 mg of amino acids (BCAA, Glutamine, Arginine) plus a super high profile of electrolytes. This product is high in carbs and low in sugar, as well. Recommended for longer and higher intensity workouts or competition requiring the replenishment of electrolytes and additional amino acid and carbohydrate energy. Amino Vital Fast Charge 30 Stickpacks Citrus Flavor - 3.70 oz. 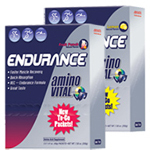 Amino Vital Fast Charge is the quickest way to get virtually instant Amino Power! Take Amino Vital Fast Charge as a granulated powder or caplets with a little water to charge a workout and optimize recovery. Amino Vital Fast Charge is recommended for people who do frequent workouts and wish to minimize recovery time by alleviating next-day soreness and stiffness. Energize, focus and repair with Amino Vital Fast Charge. Give your workout a boost! 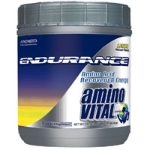 Amino Vital's Fast Charge is an amino acid power shot that quickly absorbs into the system giving muscles the extra charge and recovery they need to push though the hurdles of competition. Mix & Shake Endurance is the "All in One" Amino Vital product: 2400 mg of amino acids (BCAA, Glutamine, Arginine) plus a super high profile of electrolytes. This product is high in carbs and low in sugar, as well. Recommended for longer and higher intensity workouts or competition requiring the replenishment of electrolytes and additional amino acid and carbohydrate energy.